Being a Malaysian I love food that are spicy and will strong flavors and curry is one of them. I must have them at least once a week if not I will crave for it. I like making most curry paste from scratch if I can find the time and ingredients but if I am crunching for time I will just use the readymade paste. One of my favorite brands is Mea Ploy and it is from Thailand. I will usually keep a tub of it in my fridge so I can use it if I want to cook something quick. They do have a few types of curry paste but I prefer their Panang curry. They are really good and with great flavors. I used beef this time and they do take bit of time to cook them but if you prefer chicken you can always use it. This dish is great to be serve with some savory rice. I miss baking! Since started working I can hardly find time to do any baking. On my off day I have to run errands, grocery shopping, laundry, ironing and housework. It was difficult the first two weeks but now I am getting the hang of it and managed my time well and Carlos helps a lot too. I am thankful for that. I bake this plain old orange butter cake at the spur of the moment last week right after I came home from work. It is nothing fancy with just few ingredients that I can find in my pantry and fridge. The most important about butter cake is make sure you use good butter for it. This cake is rich and moist and great with my morning cup of coffee before heading out to work. I love daikon especially in soup or stew. I’ve stop eating them for a couple of years after being admitted to the ER for eating too much of it ha ha...Well, I am back cooking it again but this time I know I have to limit my consumption of it. I made this dish a few months ago and only get to post it now as I have put out all the Kelantan dishes first for last month. Do check out the round up here . Stew beef with daikon is a traditional Cantonese stew and I see a lot of the online recipes called for Chee Hou sauce which is a readymade soy beans, ginger and garlic paste used for braising meat. Since I don’t have it I just add some tau cheong to it. I just love this dish especially the thick sauce that is so perfect over white rice. I don’t know much about Korean food and so far I’ve only tried it a few times. The first time was in New York and my friend Tina took me to a Korean BBQ restaurant at Queens. That was the first time I tried out their grilled short ribs. There were tender, juicy and really flavorful and I was hooked. The second time I had this was at my neighbor BBQ party last year and he was kind enough to share what he used to marinate the meat. These ribs need to be marinating overnight to get the full flavors from it so if you are planning to do this for your party make sure you plan ahead. Mini Dutch baby pancake also known as German pancakes are pancakes made with flour, eggs butter, and milk that are prepared in a sizzling hot skillet and bake until the sides of the pancakes raise high above the pan, creating a light, puffy crust with tender and eggy middle. It can be eaten with cream cheese, fruit jams, or other fillings or simply drizzle it with maple syrup. I made these using the muffin pan (just like Kuih Akok) and when it bakes it batter will find its way up to the side of the pan and form a perfect pocket for me to fill them up with homemade strawberries compote. I find them cute and more presentable. They are just perfect for breakfast or brunch. When the hosting date of the Malaysian Food Fest for the state of Kelantan drew near I was very worried as I knew that it would be a very busy and crazy month for me. A new chapter in my life is starting as I am back into working world again. I know I will be crazy trying to juggle everything at once, my new daily routine and having to blog as well. As I had already said 'Yes' to hosting the Kelantan month, I would just do it and I intended to do it well. Throughout my blogging years, I have come across some not so nice characters but for each of that, I have encountered the good ones that come tenfold. For that, I am very blessed indeed, as these good people come to my rescue when I needed them the most. I was very worried that I would not have enough time to do research, the write ups and not forgetting the cooking itself which is the very essence of this whole scheme. The cooking is relatively easy but finding an authentic recipe and the ingredients is a bit of a challenge as living far away from home means I have to do without so many ingredients that are essential in many of the Kelantanese recipes. Throughout the MFF events I’ve learned many things and dishes from other states. One thing that stands out for me is authenticity of a dish. It cannot be determined per se as who is to say the dish originally came from one states. 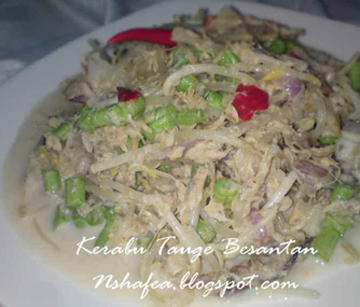 It is not uncommon in Malaysia for dishes to be begged or borrowed from other states, modified to suit local tastes and then claimed as their own. So let’s not be too critical or harsh if any of the dishes featured during this Kelantan MFF are not truly authentic. The whole idea of this feature is to introduce a specific region's food and encourage readers to try new and different foods outside their normal comfort zone. I am glad that so many of you accepted the challenge and joined in the fun. A special thank you to Nor of Secubit Garam for spreading the word amongst the blogger community and to get so many of you to participate, and also going the extra mile of providing me many of the pictures that appeared in the introduction posting. Also a special thank you to Cik Manggis of Jom Masak Jom Makan Makan for being my number one supporter... cooking a Kelantan based dish almost on a daily basis and also my good friend Shereen for being there for me. Also thank you to those of you who have let me use your photos and recipes, and who answered my many questions. Once again, a big, big thank you from the bottom of my heart to all of you who participate and made Kelantan MFF a huge success with 99 entries and if I left out any of your dish in the round up please let me know and I will put them up. So without further ado here are all the dishes that I received.